Royal Hills Fethiye Villa for sale is a project located on the hillside of Ovacik with amazing views over the valley and mountains. 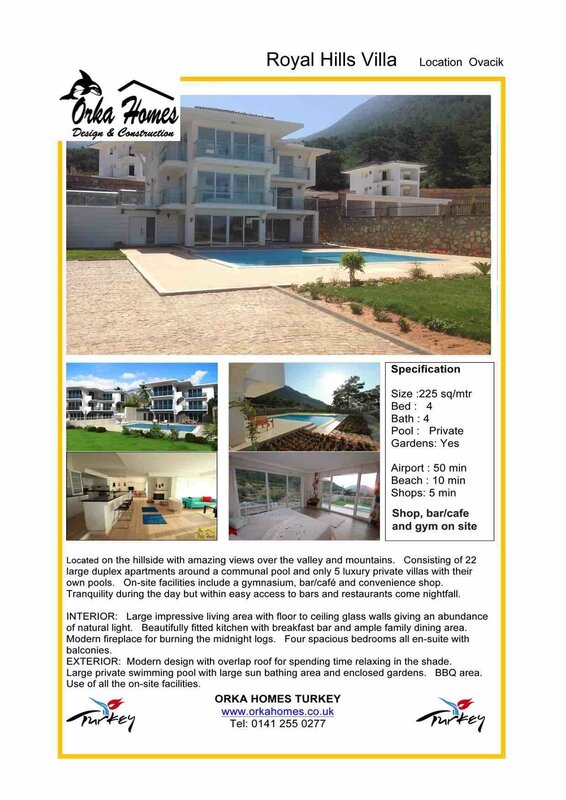 Consisting of 22 large duplex apartments around a communal pool and only 5 luxury private villas with their own pools with on-site facilities include a gymnasium, bar/café and convenience shop. This development has lovely Tranquility during the day and night and with easy access to bars and restaurants come nightfall it is the perfect location. INTERIOR: Large impressive living area with floor to ceiling glass walls giving an abundance of natural light. Beautifully fitted kitchen with breakfast bar and ample family dining area. Modern fireplace for burning the midnight logs. Four spacious bedrooms all en-suite with balconies. EXTERIOR: Modern design with overlap roof for spending time relaxing in the shade. Large private swimming pool with large sun bathing area and enclosed gardens. BBQ area. Use of all the on-site facilities.